I have been placed on an indefinite ban on creating sweet treats. The reasons contained the words "learn", "day-to-day" and "food". It's right though. I really can't feed my future children fancy shmancy cookies and cakes and puddings can I? Sort of related side note: I probably will. In all honesty, I never really was as confident about savouries as I was about sweet stuff. I was more nervous around salt than sugar. But I had to try it. I can't have the best sandwiches at my dream dessert shop if I didn't know my way around salt and spices! Pinterest gives me the best bacon recipes, chicken treats, pizzas and rolls in the whole world. If I wasn't confident about salt, none of that couldn't come to life. Salt had to become a good friend, if not as much as sugar. Sugar and I are besties. BFFs. On a separate yet related note, I am very fond of Oriental food. That includes, Chinese, Thai, Malaysian, Vietnamese. Even Chinjabi. That hotter-than-hot Punjabi Chinese, Thai Cashew Chicken that is closer in relation to Chhole Bhatoore than a decent Banh Mi, more fiery Bird's Eye Chilli than salt. 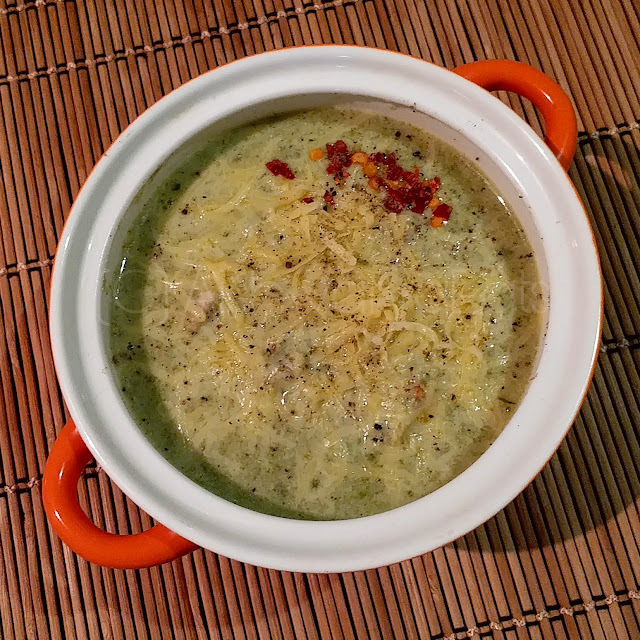 A Thai Green Curry is a green coloured Kadhi. The thicker than oatmeal Sweet Corn soup. It may not be authentic, but it has almost ended up defining Indian Oriental cuisine. I love these restaurants you know, these establishments with any of the following two words in it's name: Dragon, Lotus, Red, Chilli, Pond, Golden, Oriental, Chopsticks, Noodle. Having completely adapted a cuisine to something so Indian, so much so that it's a different cuisine altogether! From the roadside dhabas to these mid-level restaurants, Chinjabi is what you will find everywhere. 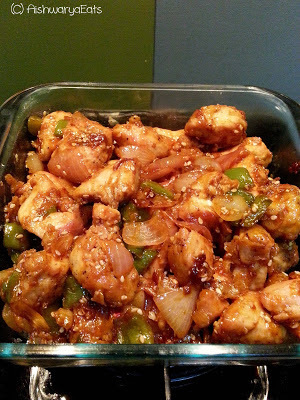 So one this Saturday, I decided to mix the above two monologues, and made the world's best Sweet and Sour Sesame Chicken. Sticky sweet, chicken pieces as soft as egg whites crusted with sesame seeds, playing around with thick juicy pieces of sweet onion and capsicum. I wish I made about a country's worth, because by the time it the serving dish touched the table, it was over. Try it out, it was a raging success in a household of authentic Oriental lovers! 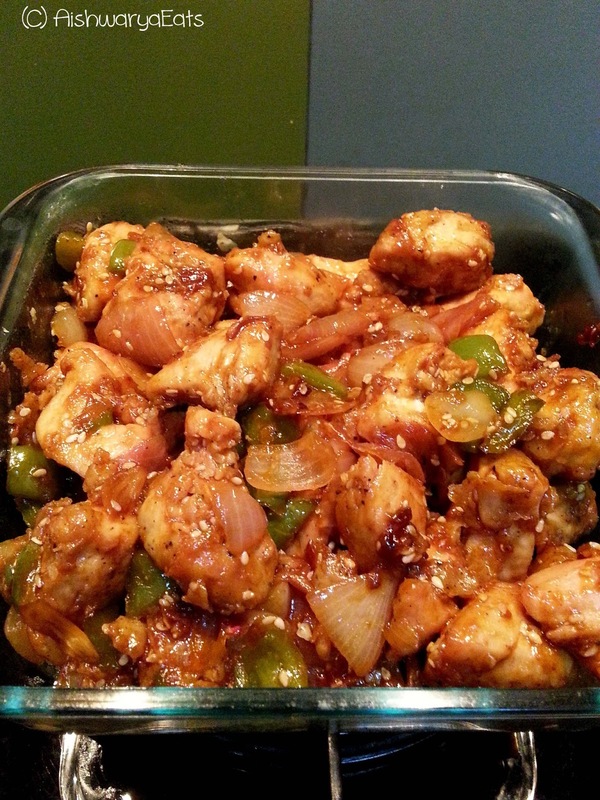 Boneless chicken- 2 or 3, in small slices or pieces. Garlic- as much as you want, sliced. Toasted sesame seeds- a handful. Diced onions- 2 large. You can increase or decrease as per your taste. Diced yellow, red and green peppers- As much or as little as you want. Any other assortment of vegetables you think would be good with it. Spring onion, slivers of baby corn, anything. Soya sauce- A good splash. Tomato sauce. Not ketchup. Get Maggi Hot and Sweet Tomato Chilli Sauce, works the best.- Another splash. Clean and wash the chicken, drain it well. Marinate in salt and pepper only. You can do this in the morning, to make this delight in the evening. In the evening, drain the marinated chicken of any liquid that may have gathered. Crack an egg into it. Mix it up well. You can also take the beaten egg in a bowl and dip it and do the flour-pat-down like in the next step, but I find that to be a dreadful waste of food. Now you can either take each piece of chicken and pat it down in the flour kept in a separate plate, or you can put the flour in the chicken and coat it well. Up to you. 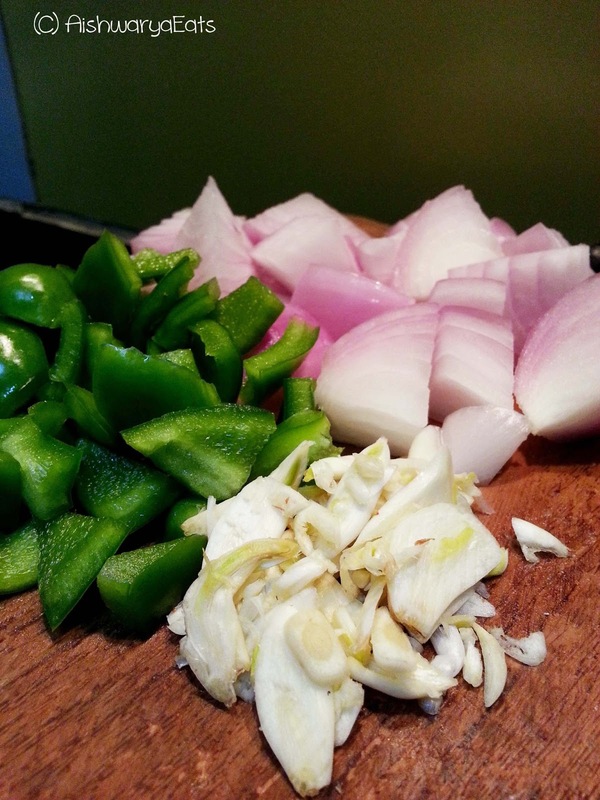 Chop up the onions and the peppers, and other vegetables. In a kadhai, heat the oil and fry the chicken in it. Drain it on paper towels if need be. In the same oil, fry the garlic till just beginning to take on a golden colour. Fry the onions till just glossy. Authors call this phase "sweating". I lose my hunger at the thought of eating ANYTHING that is sweating. Tip in the capsicum. Saute till there's this lovely sweet green fragrance from the capsicum. Green you ask? 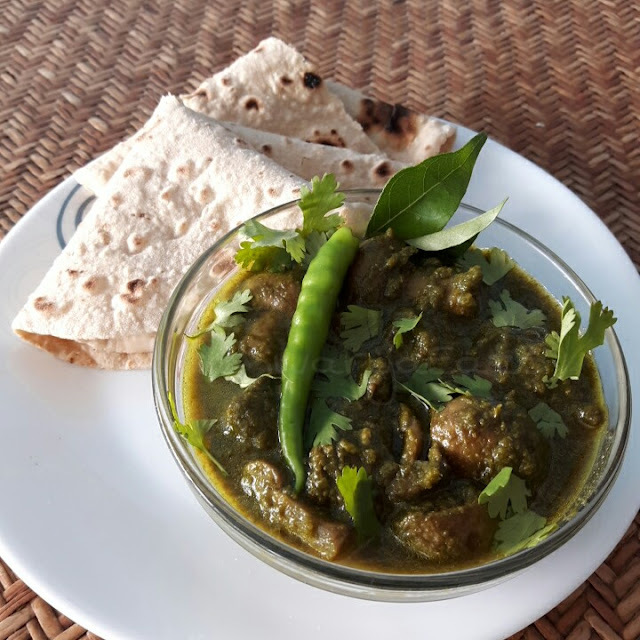 Next time inhale the scent of a palak juice, or dhania, or capsicum frying. Yeah, that's what I'm talking about! 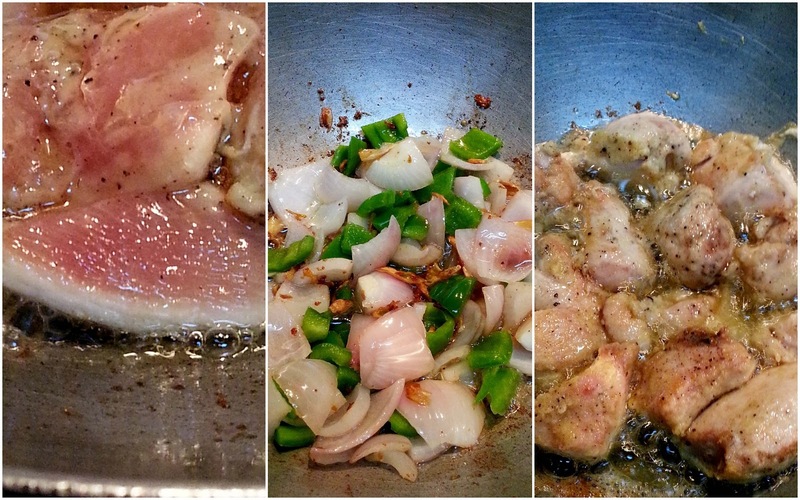 Put in the chicken pieces and stir. One by one, put in the tomato sauce, soy sauce and vinegar. Mix it up real nice. Put in the toasted sesame seeds. A good handful. Sesame gives this sweet toasty brown little bursts of flavour, that I just can't resist! Just before the entire thing is done, put in the honey. Stir it well to coat it. The point is that it should be sticky sweet with little bursts of crunchy sesame seeds. This is the stickiest most finger-lickin' good chicken you'll have. If you have fingers left after that, let me know how it was! Till the next time..Happy Eating! Nice! 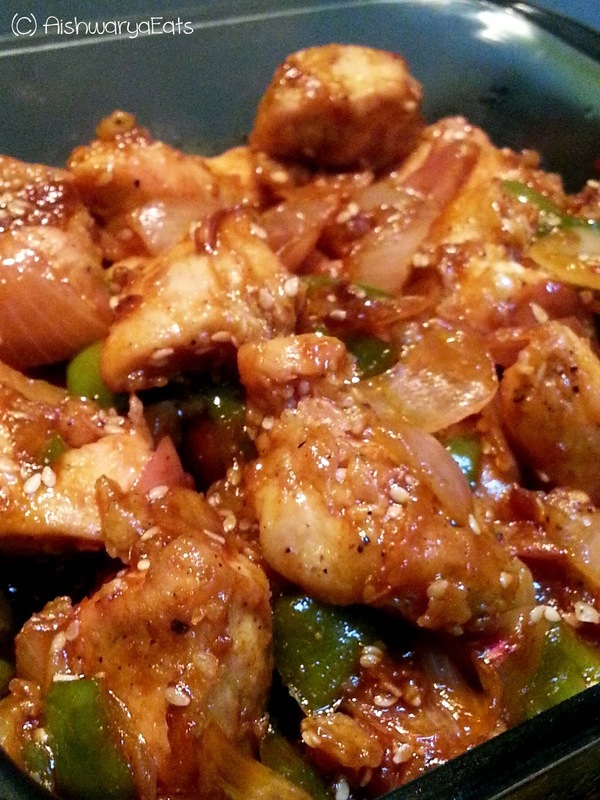 I love this kind of chicken with lots of diced onions and bell peppers. Will give this a try! Ooh!! Yummy! I definitely want to make this for my Asian cuisine-obsessed boys! !